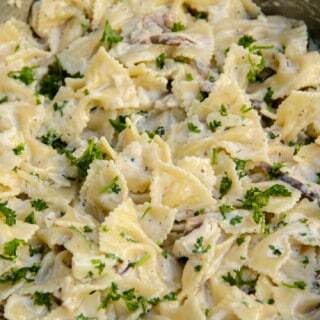 Creamy pasta with savory mushrooms! Boil the pasta al dente in some salted water. In a non-stick skillet, melt the butter on medium heat. Add the garlic and saute for 1 min until fragrant. Cook the onions and mushrooms in the butter and garlic until they are both cooked through. Add the heavy cream and let the sauce cook until it starts to thicken at a low simmer. Be sure to mix frequently. Add the cooked pasta and mix to coat the pasta with the sauce. Add salt/pepper to taste, some dried thyme or sage, and freshly chopped parsley. Mix and adjust herbs to taste. Let the pasta cook for 5-10 minutes on low heat. Top with fresh Parmesan cheese if you prefer and serve hot!